C-Line Products, Inc. at ReStockIt.com. Ever wonder where those sheet protectors, shop ticket holders and name badges you and your company use so often come from? Most likely, they were made by C-Line Products, Inc.C-Line is the leading manufacturer of office supplies including plastic storage, identification and organization items and is headquartered in Mount Prospect, IL. 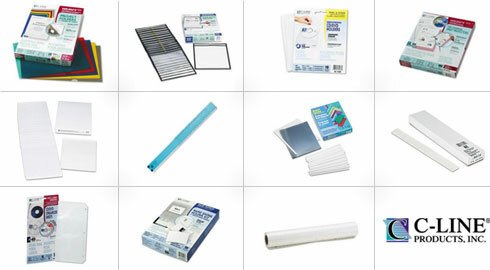 With over 60 years of experience, C-Line's product offerings include sheet protectors, name badges and holders, shop ticket holders, media storage products, laminating film, report covers and project folders, photo holders, Memory Book® page protectors, office accessories, transparency film and more. So, if you need to protect that important document, store those supplies or need new badge protectors for your employees or for that next trade show, C-Line office supply products are custom made for you! ReStockIt.com offers a variety of C-Line products, all at wholesale prices. Save up to 40% off retail when you buy your C-Line products with us!